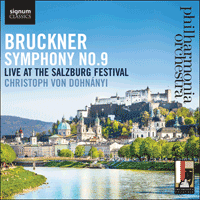 Recorded in 2014 at the beginning of a series marking his 85th birthday season, Christoph von Dohnányi leads the Philharmonia Orchestra in a rousing live performance of Bruckner’s monumental Symphony No 9. Bruckner conceived the Ninth Symphony as the culmination of his life’s work—the final part in a trilogy of monumental symphonies that had somewhat belatedly catapulted him to prominence in Vienna at the end of the 19th century. That the symphony was to be his most personal artistic testament is confirmed by its dedication to ‘dem lieben Gott’ (dear God). As Bruckner explained to his physician Richard Heller, his previous two symphonies had been dedicated to ‘two majesties, to poor King Ludwig and to our illustrious Emperor, as the highest earthly majesty I recognize’, so it seemed appropriate that this final work should be offered to ‘the Majesty of all Majesties, to dear Lord with the hope that He will grant me sufficient time to complete it and mercifully accept my gift’. As was his customary practice, Bruckner began work on his Ninth Symphony almost immediately after having completed his Eighth in the summer of 1887. Given that he had worked on the Eighth for three years, he no doubt envisaged that under normal circumstances the new symphony would have been finished by 1890. Unfortunately, a sequence of events conspired to throw this plan drastically off course. First and foremost, he experienced an almost catastrophic blow to his hard-won self-confidence when the conductor Hermann Levi, to whom he had sent the recently completed manuscript of his Eighth Symphony, informed him that he was unable to comprehend the score and would not be prepared to programme it. Bruckner took this rejection by a highly respected colleague very much to heart and almost immediately began a comprehensive revision of the work—a process that occupied him for at least three years. Further distractions hindered Bruckner’s plans for the Ninth. For example, whilst revising the Eighth, the composer was also persuaded to issue new versions of his Fourth Symphony in 1888 and his Third in 1889. An additional bout of revision mania followed during the early 1890s. Undoubtedly the most time-consuming project was his decision in 1891 to subject every bar of his First Symphony to forensic transformation, the resultant work offered to the University of Vienna in gratitude for them awarding him an honorary doctorate. Yet at the same time as revisiting many of his earlier works, Bruckner also expended considerable creative energy on writing two substantial choral pieces: Psalm 150 and the cantata Helgoland. Only after these projects had been accomplished was Bruckner able to focus all his attention on the Ninth. Inevitably, the inordinate delay in making any serious progress on the work begs some questions. Did the composer prevaricate for so long for the simple reason that he had become overawed by the sheer enormity of the task he had set himself? Had he become inhibited by his decision to cast this symphony in D minor, the same key as that of Beethoven’s Ninth, since this invited obvious comparison with the work of his great predecessor? The evidence, on both counts, suggests otherwise. We know from conversations with his students that Bruckner positively relished the link with Beethoven, and that he frequently emphasized the fact that ‘Beethoven had also made his farewell to life with his Ninth’. Furthermore, the dates inscribed in the orchestral manuscript of the symphony deposited in the Austrian National Library confirm that once he had put his mind to it, the first three movements were completed in a relatively short period of time. Thus the first movement, on which Bruckner worked intermittently from 1891 onwards, was finished at the end of December 1893. Completion of the Scherzo quickly followed suit two months later, and the monumental Adagio was fully drafted by the end of November 1894. Thereafter, the composer’s declining physical health impeded work on the Finale. Even so, by the time of his death in October 1896, the structural shell of the entire movement was fully in place. Indeed, the surviving manuscript folios incorporate a wealth of material including fragmentary sketches as well as fully orchestrated sections. As with almost all of Bruckner’s other symphonies, the dissemination of the Ninth was fraught with controversy. Seven years after the composer’s death, the conductor Ferdinand Löwe performed the first three movements at a memorial concert in Vienna’s Musikverein. As one of Bruckner’s most devoted disciples, Löwe was anxious to secure a posthumous triumph for the composer. But he subjected the score to numerous alterations of instrumentation and adjustments to the harmony believing that such modifications would make the music more palatable to contemporary audiences. Löwe’s edition reigned supreme during the first 30 years of the 20th century until the Austrian musicologist Alfred Orel published a new edition of the work in 1934, which was based on Bruckner’s original manuscript. Two years earlier, the conductor Siegmund von Hausegger mounted an extraordinary concert with the Munich Philharmonic on 2 April 1932 in which he performed two renditions of the Ninth, the first using Löwe’s bowdlerized edition and the second featuring Orel’s score. The audience were invited to assess the respective merits of the two versions but emphatically endorsed Bruckner’s original. Thereafter, Löwe’s version of the Ninth was largely discredited, and almost all performances used Orel or (as here) the 1951 edition by Leopold Nowak which merely corrects a few misprints in the earlier score. Whereas textual issues concerning the first three movements of the Ninth Symphony were now completely resolved, there was little consensus with regard to the Finale. It was widely assumed that as a result of his declining health, Bruckner had made little progress with the movement, and what survived was not of sufficient musical quality to warrant public performance. Such a myth was perpetrated for many years. However, the publication in the 1990s of the sketch materials for the Finale suggests that the movement was much more complete than had previously been realised and it boasted musical ideas of startling originality. Despite the fact that there were some missing pages and some passages lacking full details of orchestration, it was possible to reconstruct the Finale largely according to Bruckner’s clearly laid out plans. Although the various reconstructions of the Finale that have appeared in recent years have enabled listeners to gain a rather different perspective of the overall trajectory of Bruckner’s Ninth, the fact remains that the three completed movements form a completely satisfying musical entity. Furthermore, the notion of ending a symphony with a valedictory slow movement, even if this was not Bruckner’s original intention, mirrored several other symphonic works that appeared during this period, most notably Tchaikovsky’s 'Pathétique' (1893) and Mahler’s Third (1897) and Ninth (1911). In marking the first movement Feierlich, misterioso, Bruckner invokes a similar tempo designation to his Third Symphony, which shares the same key of D minor. Indeed, the shimmering strings of the opening, which form the backcloth to the ominous first theme enunciated in the low brass, are strongly reminiscent of the earlier work. But whereas the analogous passage in the Third remains rooted to strongly tonal harmonies, in the Ninth Bruckner almost immediately subverts any sense of stability with a sequence of brief chromatically restless musical ideas that become increasingly fraught as they build up to a massive unison climax for the full orchestra. In contrast to the awesome power of this opening paragraph, the second and third themes seem more lyrical in character, providing the movement with necessary repose. Yet an element of unease is never far from the surface and is most obviously reflected in the piercing tritonal harmony between flutes and horns that ends the exposition. Much of the rest of the movement returns to the disturbing death-ridden musical imagery first heard in the opening paragraph. A series of tormented climaxes, often followed by unexpected pauses, creates a feeling of anxiety and uncertainty that culminates in a passage of demonic fury at the relentless fortissimo restatement of the third theme. After this comes a brief prayer-like sequence of chords in the woodwind, which recalls the Gloria of the D minor Mass. Finally, Bruckner seeks to reiterate the tonal primacy of D minor in the coda, though the grating and persistent E flat notes in the trumpets in the concluding triple-forte passage hardly suggest that the music has achieved any real sense of closure. The harsh chromaticism that permeated much of the first movement reappears in the Scherzo. Initially, the mood is subdued as pizzicato strings trace the individual notes of some tonally ambiguous sustained woodwind chords. Then, almost without warning, Bruckner unleashes the full power of the orchestra in a passage of surprising ferocity, where pounding rhythms are punctuated by grating dissonances in the brass. Somewhat later, a solitary oboe makes a valiant effort to transform the mood into one of playfulness. But the tonal instability of the accompanying harmonies undermines this, ultimately bringing a much more sinister gloss to the proceedings. A similar narrative is projected in the Trio. It opens in the remote key of F sharp minor with mercurially light-textured strings and the flute’s lively imitations of birdsong—a passage that momentarily recalls Mendelssohn. Soon, however, dark clouds appear on the horizon with a more sober melody accompanied by characteristically unsettling harmonies. After the strangeness of the Scherzo, the opening unaccompanied violin threnody of the Adagio, with its anguished upward interval of a minor ninth, nakedly exposes Bruckner’s loneliness and torment. There is a desperate attempt to achieve some element of consolation with a momentary cadential allusion to the ‘Grail’ motif from Wagner’s Parsifal. But tonal instability quickly intervenes with a gradual build-up to the first climax in which dissonant harmonies are reinforced by insistent repetitive brass fanfares. Following this, the horns and Wagner tubas quietly intone a sombre chorale, a passage that Bruckner described as his ‘farewell to life’. The rest of the movement unfolds in a similar manner, juxtaposing passages that are angst-ridden with moments of radiance and warmth that have an unmistakable religious connotation. But whereas the slow movements of the Seventh and Eighth symphonies move inexorably towards a final apocalyptic yet triumphant climax in a major key, no such resolution can be achieved in the Ninth. Instead, we have a terrifying vision of hell with low brass relentlessly blaring out the opening violin theme against a sustained dissonant harmonic background. This extraordinary passage culminates in a violent unresolved discord, which is followed by a moment of silence that is almost as shocking. For a brief moment Bruckner responds to this by making a further attempt to generate another climax. But the suffering suddenly subsides to be replaced by music that attains a sense of calm resignation in an unequivocal E major. Framed by thematic references to the slow movements of the Seventh and Eighth symphonies in the horns and Wagner tubas, the tonal clarity of this closing passage is wonderfully affecting.